Ooh stop press! 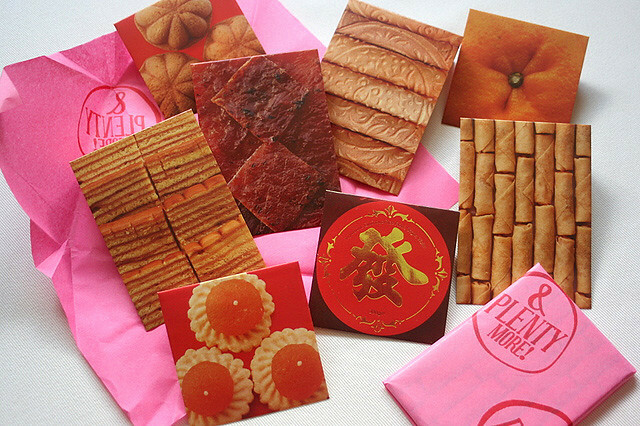 Look at these deliciously themed "hong bao" or red packets, by a local quintet of young designers called "&PLentyMore". They got featured in the Wall Street Journal blog! OK, that post is a little snarky of Singapore and the tacky side of Chinese New Year, but is such a boost for the designers who face the uphill challenge of selling "ang pao" envelopes that are freely available from more companies than we can count. 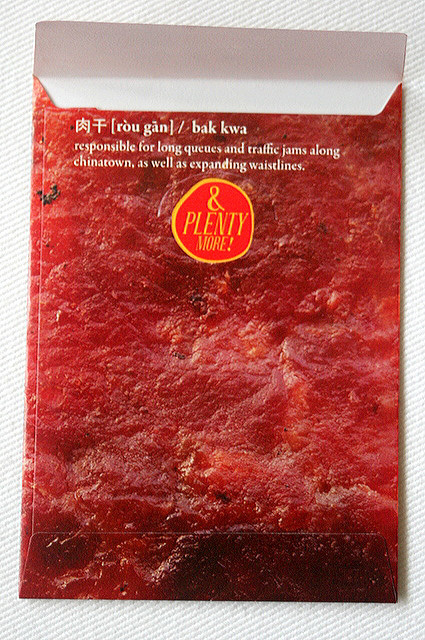 But you know, it is so cool to hand out a slice of photogenic bak kwa or kueh lapis, instead of cartoonish or red-gold embossed prints. For once, recipients might actually be more distracted by the envelope than what's in it. The ang paos come wrapped in that old school pink paper wrapper used by the Chinese for various things from candy to traditional Chinese medicine. Open the packets, and you'll see witty or cheeky descriptions of the food printed at the back. They do cost more than ordinary ang baos - S$5 for a pack of eight designs (four square ones - pineapple tarts, nian gao, kueh bahulu, mandarin orange; and four rectangular ones - kueh lapis, bak kwa, mini shrimp rolls and love letters). Many thanks to my friend Yvonne who passed me two packs. Nice. But the more traditional folks might not like it cause they prefer red Ang Pow. DK: these are still pretty "reddish" or warm coloured. The young and hip might prefer these. Shirley: Sorry if I wasn't clear - these are S$5 for a pack of 8. Actually not too bad for something a bit unusual.